In general high chairs are considered to be used for meal times only. But the latest trendy high chairs have additional features which enable you to put some baby toys in their shelves, space for babies to take a nap etc. mixing with your lifestyle. Moreover, they are quite easy to handle and clean. 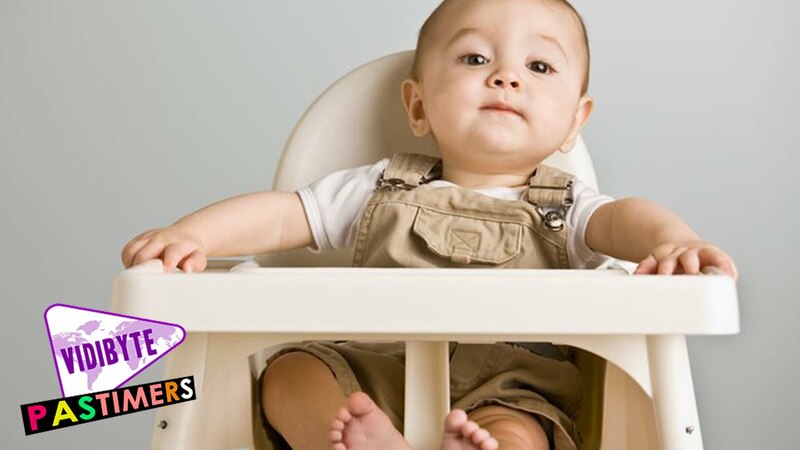 This article elaborates Top 5 high chairs with their convenience features. If you think we have missed anything please leave us a comment below. This high chair is ideal if you have a spacing problem as it is easily foldable and requires minimum space. It consists of five- point harness system and a t- bar to ensure baby’s security and safety. It compromises of two tray, the back one is to easy and very helpful while feeding the baby. A reclining seat, easy height adjustment and washable and reversible cushions make it a good choice for your baby. This high chair is quite strong and well built having two trays. The top tray is a snack tray and the bottom tray is removable as per requirements. The high chair has a vinyl cover which can be easily wiped and can be washed by machine if required. It has a height adjustment facility, easily foldable and requires less storage. The seat provided is very spacious and can even be used for naps by the baby. #3 Zooper – Peas and Carrots – This high chair is of aluminum frame and quite comfortable having colorful vinyl cover giving the chair a modern and stylish look. The chair is bit big and larger than all other chairs having four heights position, wheels with locking facility making it quite safer. In spite of being bigger and larger the chair is portable and easily storable with less space requirement. It has got a lower tray which helps in feeding the baby by keeping the food out of the baby’s reach. The high chair is provided with a bar to keep the washcloths ready. An easy chair with washable vinyl cover and a t- bar for safety. This high chair is easy to operate using one hand whether it may be for height adjustment or wheel locking. It has a button to fold the chair in an upright position. The seat cushion is quite thick and comfortable. Moreover it is also easily removable for cleaning and wiping. High chairs are needed for the babies when they grow to about six months and start eating solid food. You can choose to buy it earlier so as the baby can join you on the table only to watch. The more important matter is if the high chair is really safe? But, it is a matter of personal choice. It is best to choose a high chair model with Juvenile Products Manufactures Association certificate on it. Look for a stable high chair. A high chair should have wide base so as not to move with the wiggling baby in it. Give the chair a good shake and see if it is easy to tip over. A high chair with wheels is a good option but see that the wheels are locked firmly. A folding one will also do but again the locking mechanism should work well so as not to fold when in use. A high chair for long term use should have height adjustment. This will help as the child grows to a toddler and then to a kid. A chair with recline feature is best for a toddler who might fall asleep after a long tiring day. Check for the five point harness as it works safe. You can opt for the molded seat with a lock between the legs so as to avoid the slipping of the child. Chairs with washable cushions are must as babies tend to drop food while eating. The fabric has to be soft with no sharp edges at the fitting. Check for a tray with high rim to avoid dropping of food. One hand sliding tray works well for a busy mom. The tray should be removable for washing purpose. Like all parent i am trying to ensure all necessary product for baby safety and comfort. Thanks for sharing best portable high chair. I am searching best one for my 2 years baby. Really helpful to choose best one. Thanks against for sharing with us. Amazing ! I am searching best portable high chair to make my travel time easy and comfortable with my little one. Really helpful guideline to choose best one. Thanks for sharing such a helpful guideline.